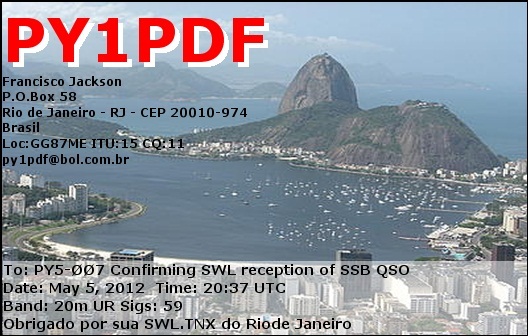 eQSL recebido: PY1PDF, Rio de Janeiro, RJ, Brasil, 14 MHz, QSO w/ PY6HD. 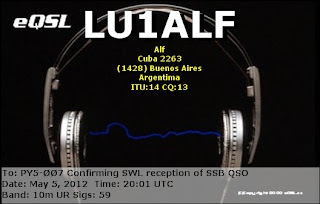 eQSL recebido: LU1ALF, Buenos Aires, República Argentina, 28 MHz, QSO w/ OE5LXP. 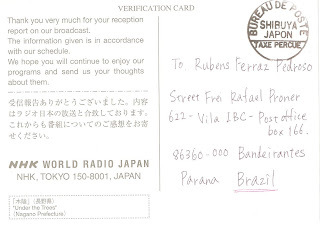 Rádio Japão (NHK), 11.965 kHz - Yamata/Japão. 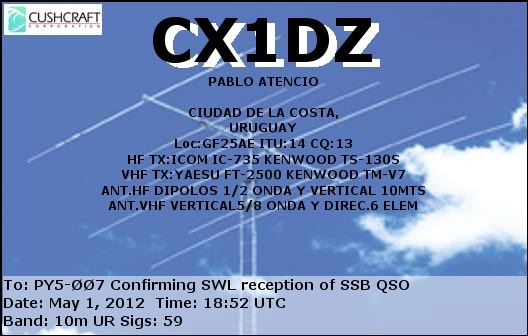 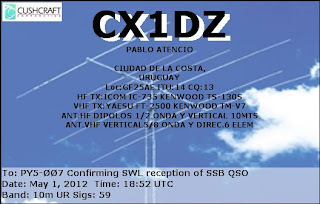 eQSL recebido: CX1DZ, Ciudad de la Costa, Uruguay, 28 MHz, QSO w/ PI4CC. 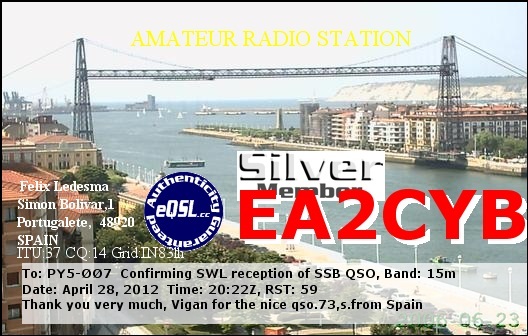 eQSL recebido: PD1ATH, De Westereen, The Netherlands, 14 MHz, QSO w/ PY6HD. 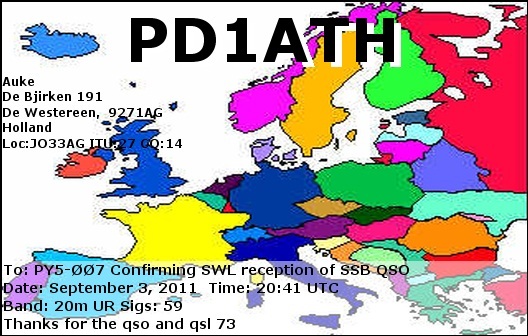 eQSL recebido: PD1ATH, De Westereen, The Netherlands, 14 MHz, QSO w/ PY6RT. 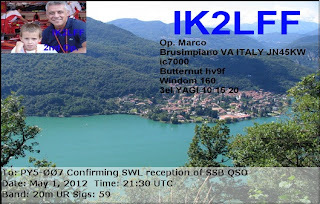 eQSL recebido: IK2LFF, Brusimpiano, VA, Italy, 14 MHz, QSO w/ ZP5MAL. 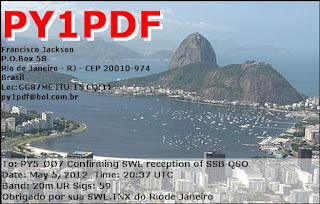 Please receive our congratulations on Dia do Trabalho! 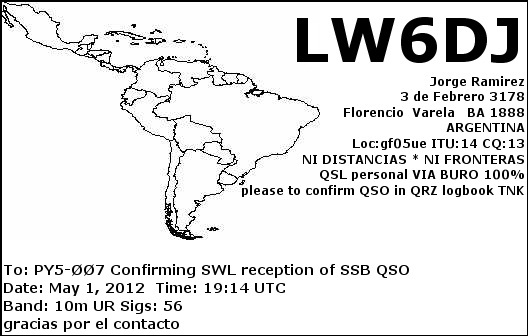 We have received your message and are very glad to learn that our program is listened in Brazil. 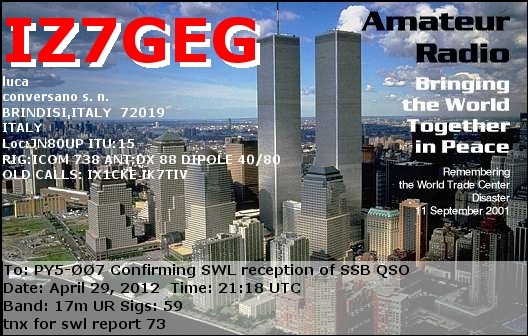 We appreciate your detailed description. 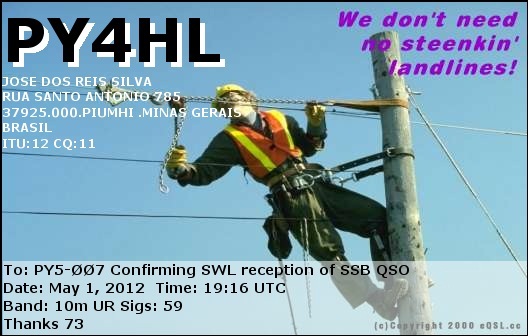 Please kindly find enclosed e-QSL. It is very important for us to learn that the Radio Pridnestrovie has found our listeners and raised your interest. We have received letters from all over the World and your Report is really very useful and important for our technical department. 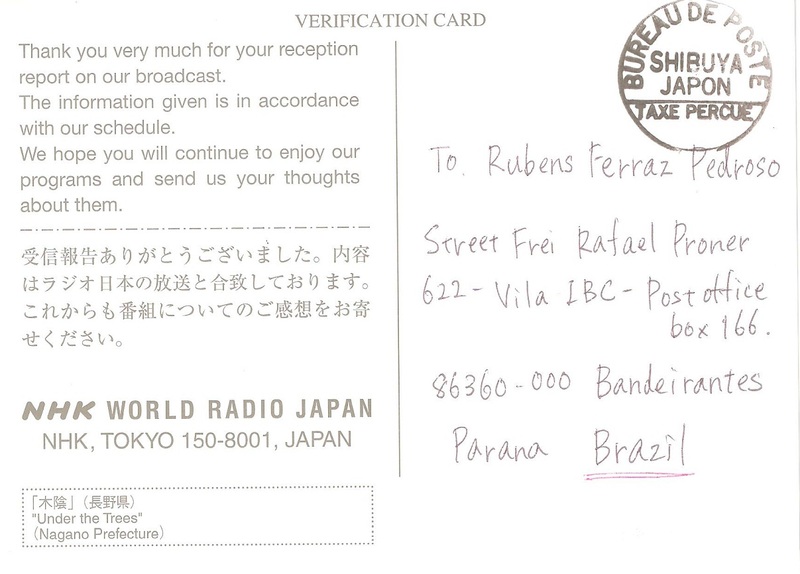 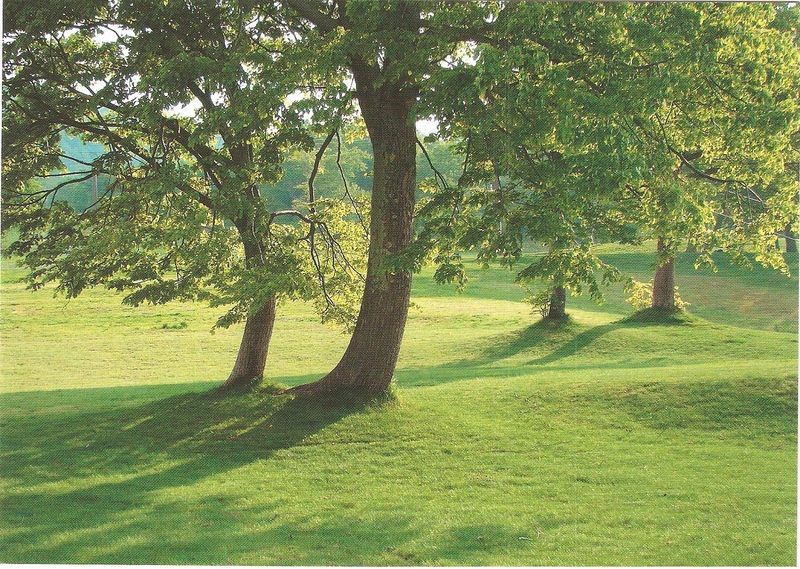 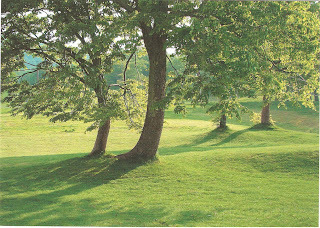 We will be glad to get new letters from you soon. 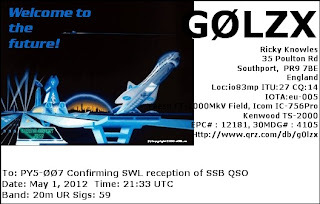 Feel free to express your opinions and wishes regarding our programs. 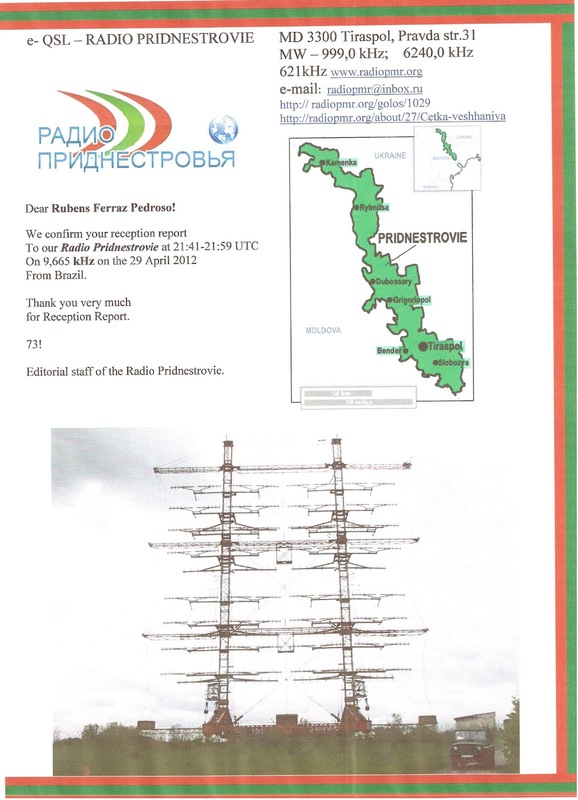 Editorial staff of the Radio Pridnestrovie. 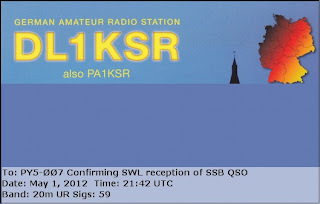 Radio Pridnestrovye, 9.665 kHz – Kishinev-Grigoriopol/MDA. eQSL recebido: DL1KSR, Apeldoorn, Germany, 14 MHz, QSO w/ ZP5MAL. eQSL recebido: G0LZX, Southport, England, 14 MHz, QSO w/ PI4CC. eQSL recebido: LW3DRH, Tandil, República Argentina, 28 MHz, QSO w/ PI4CC. 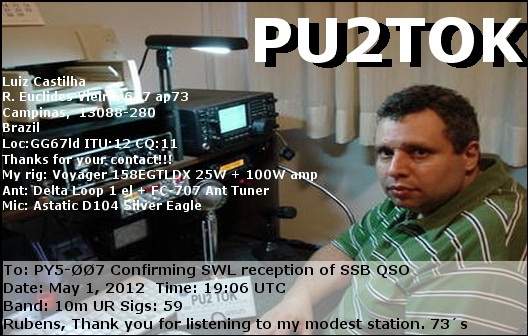 eQSL recebido: PU2TOK, Campinas, SP, Brasil, 28 MHz, QSO w/ PI4CC. 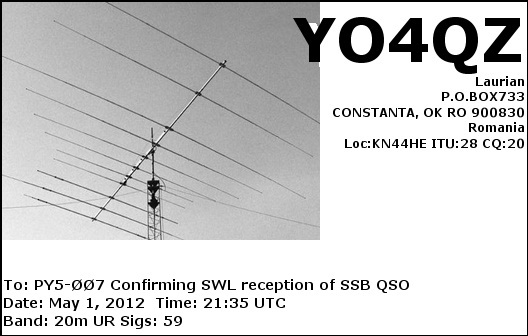 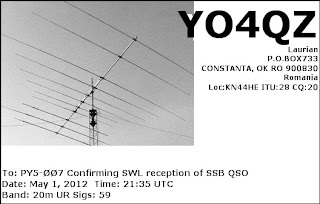 eQSL recebido: YO4QZ, Constanta, Romania, 14 MHz, QSO w/ ZP5MAL. 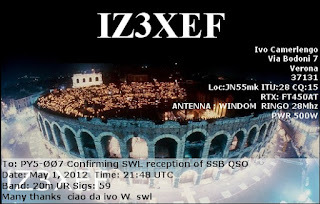 eQSL recebido: IZ3XEF, Verona, Italy, 14 MHz, QSO w/ ZP5MAL. eQSL recebido: PY4HL, Piumhi, MG, Brasil, 28 MHz, QSO w/ PI4CC. 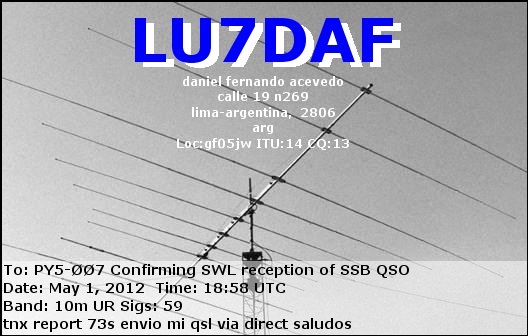 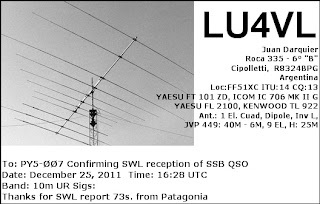 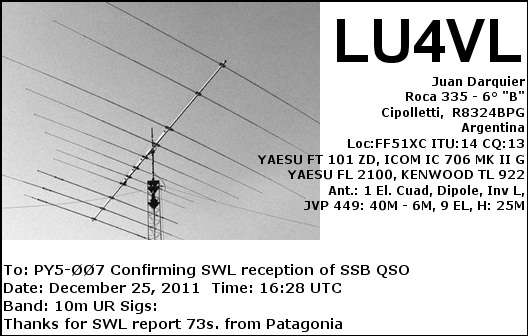 eQSL recebido: LU7DAF, Lima, República Argentina, 28 MHz, QSO w/ PI4CC. eQSL recebido: F8DWH, Bernos Beaulac, France, 14 MHz, QSO w/ ZP5MAL. 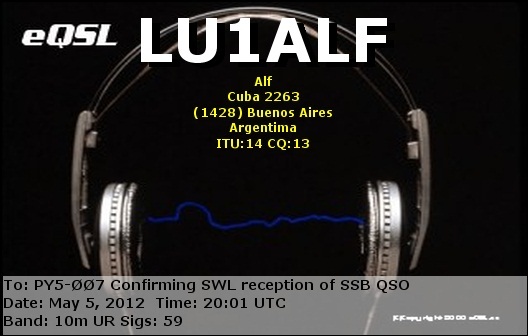 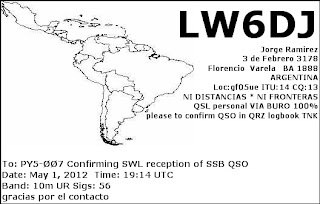 eQSL recebido: LW6DJ, Florencio Varela, BA, República Argentina, 28 MHz, QSO w/ PI4CC. 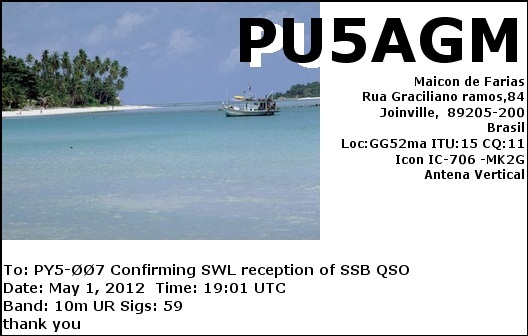 eQSL recebido: PU5AGM, Joinville, SC, Brasil, 28 MHz, QSO w/ PI4CC. 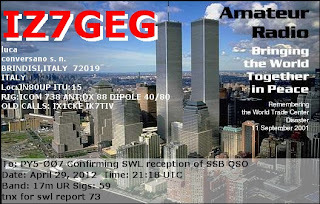 eQSL recebido: IZ7GEG, Brindisi, Italy, 18 MHz, QSO w/ 9Y4LAS. 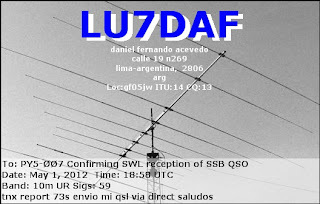 eQSL recebido: LU4VL, Cipolletti, República Argentina, 28 MHz, QSO w/ EA8CYX, EA7JJE, etc. 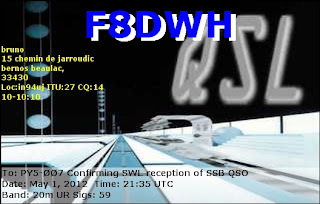 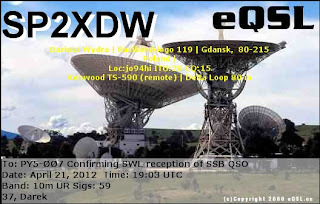 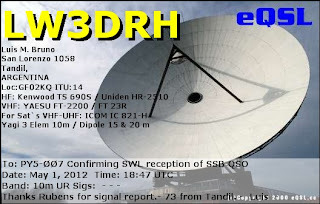 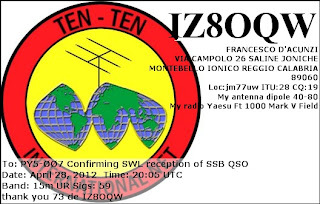 eQSL recebido: SP2XDW, Gdansk, Poland, 28 MHz, QSO w/ LU7EC. 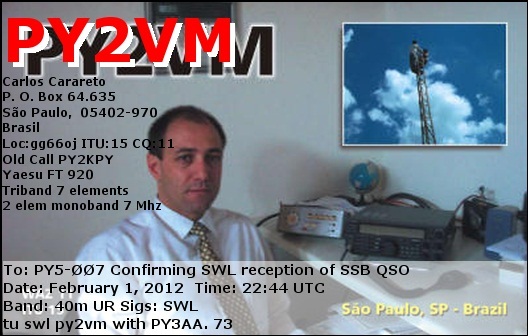 eQSL recebido: PY2VM, São Paulo, SP, Brasil, 7 MHz, QSO w/ PY3AA (Labre/RS). 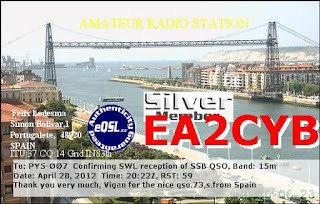 eQSL recebido: EA2CYB, Portugalete, Spain, 21 MHz, QSO w/ OH6RM. 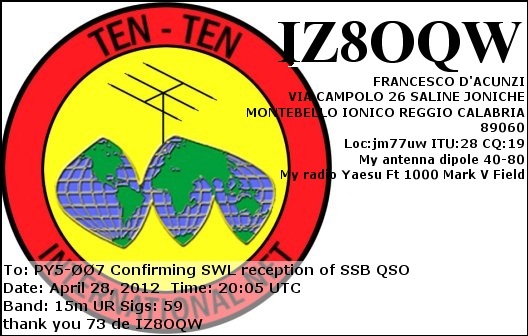 eQSL recebido: IZ8OQW, Saline Joniche, Reggio Calabria, Italy, 21 MHz, QSO w/ OH6RM.